Blue meanies Panaeolus cyanescens grow across Australia from Spring through Summer. Their season starts a little after the gold tops finish. These medium to high/very high potency mushrooms are a small greyish white with a domed cap. As it develops the cap can split and show blue streaks. It is light brown or yellow but changes colour into a greyish white colour as it matures; and the centre remains dark. It bruises blue when damaged and the gills develop black spores. Some species in Australia have a darker brown cap. The stem is thin and a blue grey colour with white lumps. The stems dry to a blue/back colour. The main way to recognise blue meanies is through the black spores and blue staining throughout the mushroom. Found: You can find blue meanies in Queensland, New South Wales with reports also from South Australia and Victoria. Find blue meanies growing in manure and on lawns where manure is used as a fertiliser. 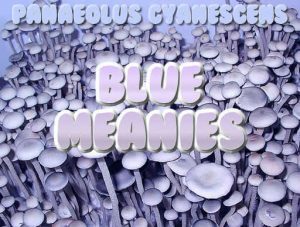 How much to take: Blue meanies panaeolus cyanescens dosage. You need to take between one and three large or five to 10 medium-size fresh mushrooms to get a potent hallucinogenic effect. When consuming blue meanies dried you, you start with 1/4 gram for a newbie up to a maximum of 2.5 grams for the most experienced shroomer. If you use them on a regular basis, your system will build up a tolerance. This means you may need to take more and more to get the same effect. If this happens to you, take at least a 7-day break before taking any more. Never take recommended dosages. You should always start using the smallest dose to see how your body reacts to it. The darknet have a guy or two selling spores. Golden teachers from memory. Quite cheap. My mate grew some rippers a while ago. I’m interested in obtaining some mushrooms but I am completely new to this venture. As I live in Queensland I have the ability to go and source ones that are naturally growing however I don’t know where to start looking. An alternative is to grow my own with spores, if Its possible to purchase them. If you could give me some advise it would be HIGHly appreciated.